This is the time of year when Kindergarten students are studying relative measures like weight. This art and science-integrated engineering lesson taught teamwork, failure, tenacity, and experimentation. 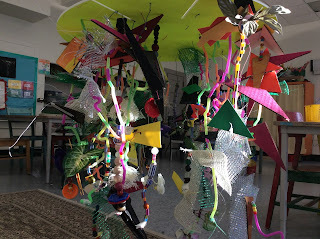 In the first class, students used materials that were on the heavier side to make a wire strand for our mobile, including big glass beads, large 1-2" buttons, and big painted cardboard shapes, among other options. This is good exercise in dexterity and fine motor development, too: artist practice using a pinching grip, use basic sewing skills to thread in and out of the holes in cardboard, and learn to twist the wire so that materials don't fall off. For the second class, students used very light materials, including sections of bendy straws, sparkly burlap fabric, plastic beads, and faux flowers and leaves. Many students were finishing their strands from the first class, and added these light materials to the heavier strands, resulting in more medium weights. "Engineers fix the train when it is broken." "Engineers can fix other stuff too, like cars." "And some can even make bridges you can drive over." "They solve problems and fix things that break." They found out that in art class that day, they would all be engineers who did exactly those things- making stuff, solving problems, fixing things that broke, and working together when it got hard. I let them know that the most likely outcome would be a class time of experimentation, failure, excitement, and occasional disappointment, resulting most importantly in experience. I assured them that a "finished" mobile was the least important thing to achieve. I hung a large, circular piece of foam core form the ceiling. Several like it have been kicking around my storage space for some time, waiting for me to figure out a good use for them. There are deep slits in towards the middle, just the right size for the strands. Additionally, I used an awl to poke lots of little holes in the surface for more hanging options. The foam core was initially hung from a wire, lopsidedly. After students made their two strands, they began to add their strands to the foam core, causing it to shift from side to side. Students could adjust where they put their strand in an attempt to balance the foam core. The strands that were slid into the slits moved around as the mobile tilted, and frequently slid right out of the foam core and onto the floor. The idea was to see how each addition effected the whole- adding something too heavy to one side might cause the mobile to shift, dumping off the work a couple of other classmates had just added. Now, you might think that the kids would be upset by having to start over. Many children were surprised, disappointed, and a little frustrated, while many others giggled and were excited when pieces fell. Not a single student expressed frustration at anyone else, and their pride and confidence grew the more they worked at it. They worked well as a team, communicated, and asked each other for help. After failing over and over to keep all of the pieces on the mobile, students found the balance right in the last minute of art class! They were so proud and thrilled. Enjoy a little moment of peace as one of the finished mobiles spins! 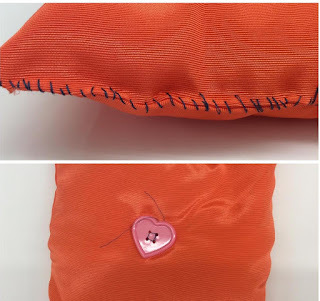 Recently, a good friend was telling me about a fascinating problem she had encountered in her professional circles: first-year med students who utterly lacked the requisite fine motor skills, highlighted by the fact that they couldn't sew stitches. Not at all. The friend went on to explain that, lacking subjects like home-economics, most schools were no longer really preparing students with the early fine motor skills needed to lay the groundwork for training doctors. Life skills, like sewing, are not something that kids should leave school without learning. Sewing used to be required, along with things like balancing a checkbook and a little basic cooking. That is why the Kindergarteners have a sewing table for choice time in art, and why my first graders just finished up sewing their first art class pillows. Seeing the first grade pillows, some fourth graders mentioned having loved the sewing project, and wanted to know, could we sew again this year? "I love my pillow," said one boy, "and I still sleep with it in my bed." Making artwork with a real, tangible product brings meaning and an enduring sense of success. In this lesson students learn to thread a needle, trying techniques to smooth the thread to go though the needle's eye. They learn to pin multiple fabric layers, and to make stitches at regular spacing so that the stuffing doesn't fall out. Students learn studio habits to carefully organize and keep track of their tools when they are using sharp objects, so that nothing gets left behind, so no one gets hurt by stepping on a pin or needle. 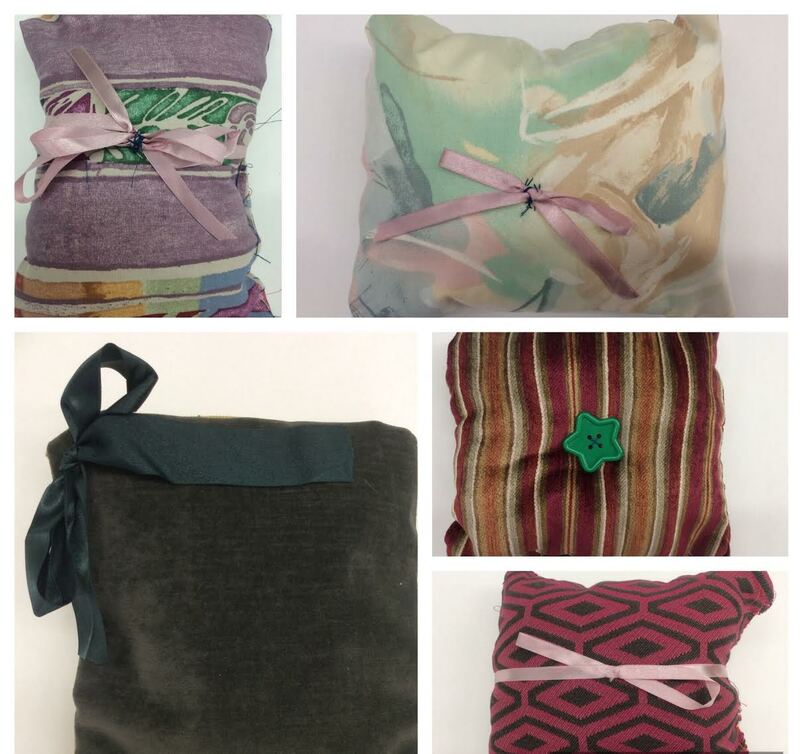 Many students added optional buttons or bows to the gorgeous fabrics, which were mostly upholstery textile samples donated by Burlington Furniture Company. They have built pillows! And, along the way, they have built patience, concentration, self confidence, and dexterity, too. A group of second graders recently had extra time on their hands in art class, and had the choice to either work in their sketchbooks or make miniature framed works of art. Anyone who was wavering was sold by the obvious joy of using glitter glue in their day. The prompt to this little project was to honor something or someone you love by making a framed work. Whether by discussed mutual agreement or just lots of parallel thinking, there were lots and lots and lots of cats! And lots of love for their families! A closeup of one adored dad! The whole family and some imaginary pets, too! Students started with four popsicle sticks, and made designs and patterns on them with colorful permanent markers. Students glued paper to the back of the layered sticks, and added a ribbon across the top from which the framed work could be hung. It was an easy, fun way to make these second grade artworks feel formal and fancy! EES students have loved a new tool, the bingo dauber bottle. Thanks to the wide array of art teachers nationally who have shared their ideas on how to use them, I recently bought a couple of dozen to let students try them out..
Our bottles are filled with india ink, so the lines are very permanent and can be painted over. The wide mark of the sponge tip of the bottles begs for large paper, so students worked on 18"x24" drawing paper. Our drying racks are not big enough to accommodate such large work, so these paintings could be seen lining the tops of the lockers down our hallway. Mr. Gillard's students looked at the artist Keith Haring, whose famous figural work was the inspiration for our classroom project. 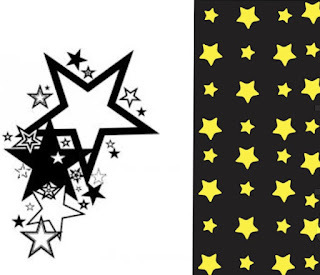 Their learning goals in ink were to create some interpretation of a figure, to segment the background into 3-5 or more spaces, and to fill at least three of those spaces with a repeating pattern or design. Students used color to create and enhance the themes of their work. The colors in the work above reinforce the excitement and energy of the figure. This artist literally split the figure vertically into warm and cool color families. 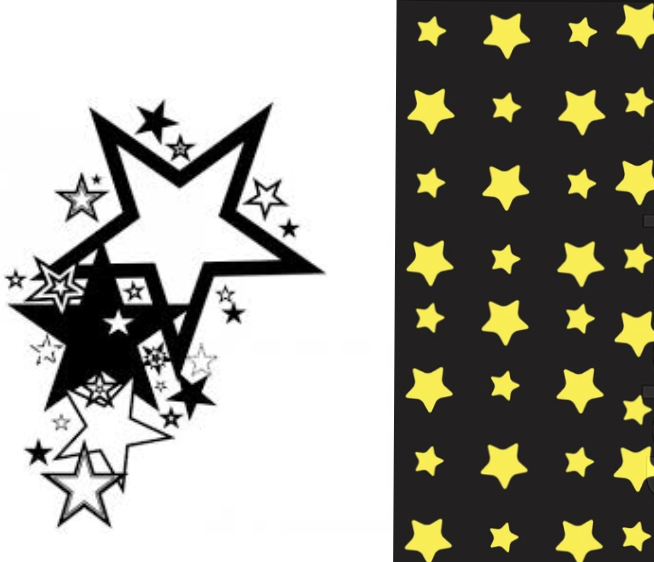 enhancing how the patterns changes across the work. Look for these at our winter Fine Arts Night in February! Artists in 2nd grade used ink bottles and watercolor to draw and paint vases of flowers on very large paper, 18" x24". Students experimented with shape and composition. 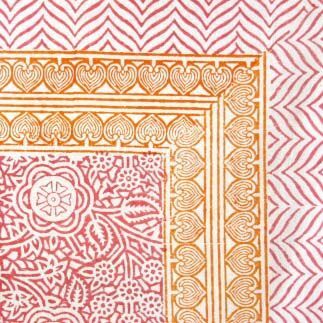 Some students chose to keep all of their flowers visible within the composition, while others chose to let the flowers crop off the edges of the paper, suggesting a bigger scene than the viewer can see. Students looked at example vase shapes, and imagined the different lines they might use to make them. Some were rounded, others squared, and some had fancy curlicues. Artists could choose to explore pattern in their artwork; the vase, the background, and the surface provided space for that experimentation with visual repetition. The work was painted in liquid watercolors. Students were reviewing their knowledge of warm and cool color families, and made the backgrounds cool to help the foreground flowers pop forward visually. What does it look like to have the gift of an artist in the classroom for five weeks? Pretty awesome. Thanks to the generous support of Vermont Arts Council, Alexandra Turner came to morning classes for grades 3-5 for five sessions. Over the five sessions, students examined intersections of science and art, rotated between stations that allowed experimentation and investigation of science and art tools and materials, and had time to reflect on the outcomes of their work. Students began with hand lenses investigating the fossils and glass pieces Alexandra brought. They made guesses about how each was formed, considering how the different materials might act. Students learned to use hand lenses to see details enlarged. On the first day, students collected and pressed a selection of plants collected right at EES. Mosses, leaves, seed heads, and flowers were among the wide variety that artists collected. These plants sat for one week inside a plant press, but could also be pressed inside the pages of a book. Our experimentation yielded that some plants were more likely to mold inside waxed paper, and more likely to dry well with plain old uncoated paper between them. In the second, third, and fourth classes, students rotated between stations in glass cutting, botanical illustration, making plant impressions into a granular clay, and printmaking with plants. At botanical illustration, artists practiced looking at plants as a scientist would. The goal of careful observation is to notice details in color and form, and record those details in the form of drawn models. Students could examine the long tradition of botanical illustration through many field guides and photos of the Blaschka glass flower collection. At the glass cutting station, Alexandra supervised students carefully cutting and measuring their glass to fit their plant's scale. It has been a dream of mine for a while to have students work in glass, and last year we studies both stained and blown glass artwork, so it was quite a thrill to have an artist who could bring this experience to our students. Safety was paramount! Gloves and glasses kept children safe. The feedback from students about the glasswork was just what I had hoped- a mixture of surprise, delight, and trepidation that led to curiosity, confidence, and joy in the process. Alexandra explaining to artists the use of the glass scoring tool. After students layered their pressed leaves and flowers (or feathers, , or twigs, or mosses- students were fearlessly experimental!) between two pieces of glass, Alexandra brought them home to her kiln to fire until the glass just began to melt and fuse. 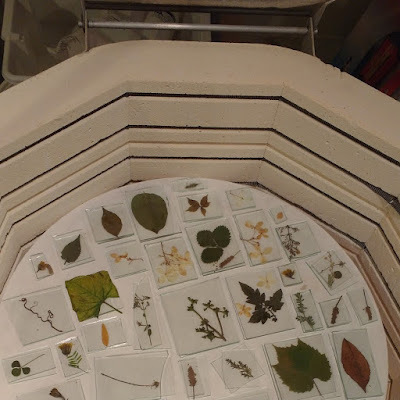 Inside the kiln before the first firing. 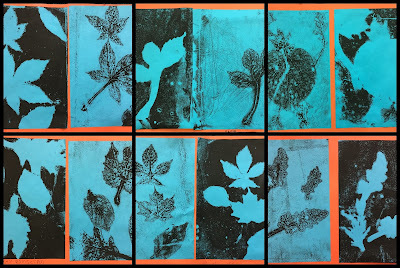 At the printmaking table, artists explored a lesson drawn from and similar to the process of teacher Cassie Stephens, using brayers to roll out ink onto a sheet of contact paper, which they overlaid with selected fresh plants. Students could create any composition, and many created creatures, people, or letter forms out of leaves. Students pulled two prints, a negative space print and then a positive, after removing the leaves from the contact paper, revealing the ink still hiding underneath. Lots of pressure was needed to press down on the leaves, so students learned how to leverage their own body weight to impact the resulting image. Here are a sampling of the finished positive/negative botanical prints. They have such a high level of detail that many plants are easily identifiable. In the last station, students used collected plants to press impressions into a granular, sedimentary-like clay, which air-dried. After it dried, students painted the whole surface, then used a sponge to relieve the paint from the raised areas, leaving an excellent fossil-like form. On their final day with of this residency experience, students used a diamond-tipped etching tool to add their name to the glass pieces they created, leaving a more permanent signature than the marker used initially for identification. Artists also reflected on the wide variety of outcomes, and on how and why some plants left behind only traces of ash, while others left the plant somewhat intact and not incinerated. Other selections left bubbles in the glass, and students surmised this might be from water in the plant boiling away after the glass has melted, and, with nowhere for those gases to go, expanded the glass into bubbles. Thank you so much to Alexandra for spending time with our students! 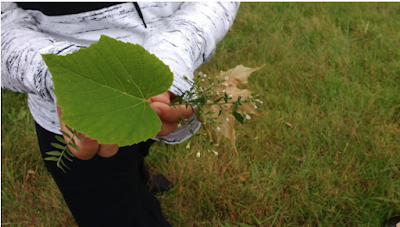 It was a joy to try new materials and unfamiliar processes, and the experience has truly deepened students' connection to the land, plants, and geology around them each day here in Burlington.